The Different by Design: Exploring Innovation for Rural Prosperity conference explores the unique potential and many possibilities that exists in rural places. The 2017 Canadian Rural Revitalization Foundation conference will be co-hosted with Applied Research and Innovation Centre, Selkirk College. 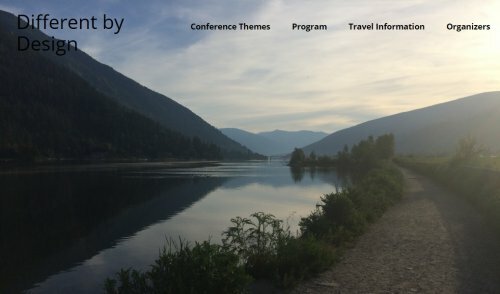 The conference will take place in Nelson, British Columbia from September 20-23, 2017. The economies of tomorrow are unlikely to look like the economies that settled and built rural regions. This raises questions like what job opportunities do we expect in the coming years? How are we addressing changing training, capacity building, and recruitment needs? How do we identify and build necessary skills? We are looking for your innovative approaches to addressing workforce challenges today, as well as what you are doing to prepare for tomorrow. We know our environments are changing. These changes range from habitat loss to ecosystem degradation to a changing climate. What are we doing to slow, stop, or reverse these changes? How are we adapting to changing conditions? We want to hear about your approaches or solutions and what you have learned. In an era of complex problems and limited resources our most valuable assets can be relationships, partnerships, and collaborations with others. We are looking for examples of collaborative initiatives between organizations – including between municipalities, with different levels of government, public-private partnerships, working with First Nations, and more. Development is often synonymous with traditional industry or business, but any rural resident knows the creativity and innovation that goes into making a living in rural places. Development opportunities relating to food, energy, recreation, tourism, arts, culture, and much more can be found across rural places. We are looking for the ideas you have tried or would like to try and what you have learned. Accredited professional development sessions will be offered – more information to come! Conference organizers are now accepting submissions for oral presentations, panels, capacity building sessions and posters. The deadline for the first call is March 10, 2017. Click here to submit.